Hooray! The makeover of the formerly boring beige laundry room is pretty much complete—we finished the blue touchups on Sunday afternoon. 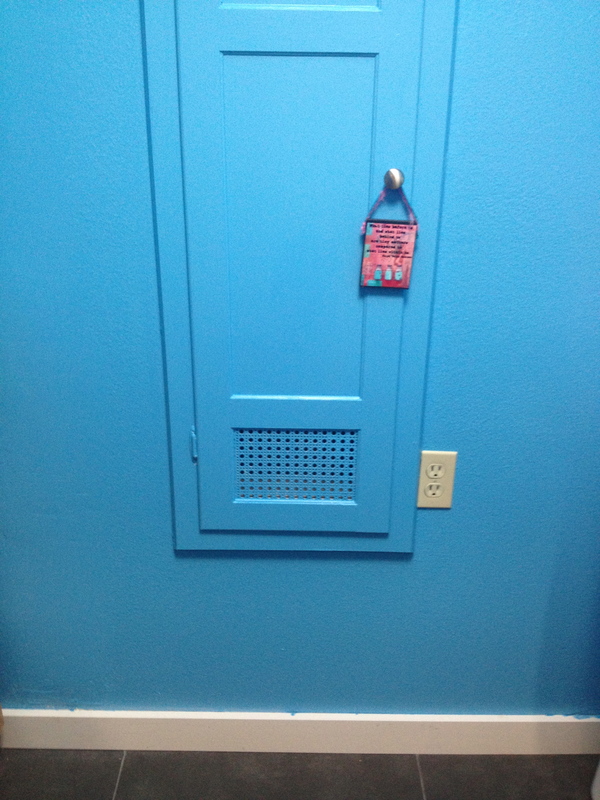 I still need to get out white paint for the trim and the door, but the ultra blue (the paint color is called Azurean) makes me smile whenever I see it and it really brightens up a room that’s really not known much for fun. We’re really pleased with how it turned out and I plan on getting the cabinets all organized during this long weekend. There’s a ton of space for the laundry stuff, some cleaning supplies that don’t need to go in the utility closet. It may even be the home of Morty, the much neglected sewing machine (he really needs to come out and see some use in this last part of 2013). Morty would look pretty slick in this room because he’d stand out. Of course, the sewing basket and all of the fabrics I’ve been saving (truthfully old clothes I’m either going to repurpose or just practice with) should probably live here too. While the color is certainly not a typical midcentury color (maybe too extreme—you think? ), it makes me happy. So does the ironing board cabinet. Do you have one of these babies in your house? This is the second house that we’ve had that has had such a built-in. In Toronto, we removed one to free up some needed space. Here, it’s perfectly fine where it is, although we don’t really use it. I just love the lattice screen at the bottom. The knob is not original and it’s not what I would have chosen, but it’s here. If I find something cool, I may replace it just for kicks. For now though, it’s fine. The new ceiling light makes me happy too. The circles remind me a little of soap bubbles which is fun for a laundry room. The designers probably intended some grander purpose for it than lighting up the sorting and folding, pouring and spraying that will happen in here. Maybe a dining room or kitchen—or even a foyer (in Texas, it’s pronounced FOY-yer by the way, so I usually say entry, lest I be accused of putting on airs by Frenchifying the word). It puts out a ton of light so it’s great for the laundry room. And for lighting up Guinness, who has recently rediscovered his love of the laundry room now that there are no paint cans, tools, and tarps in his way. It’s also a nice place to hide from the younger ones and their rambunctious romping and destroying of toys. Bruce calls George and Gidget the NGs (new Gs) and Guinness and Godiva the OGs (Old Gs). Speaking of the Gs, Gidget got a bright blue ear on Saturday afternoon as Bruce was painting behind the washer and dryer. That makes her even more official as a member of the 4G Network. Now, every one of those dogs has now gotten paint from this house on them. Guinness and Godiva have gotten orange and avocado green on them, George managed to paint himself with bits of gray while we worked on the office/tv room. And I always manage to get some in my hair too. Not sure what that says about me except that I’m klutzy. So that’s what we were up to last weekend. Bruce wants to put a shelf above the washer and dryer, but that’s a project for later once we see how we like the new set up. We also took Gidget to our vet and found out that she’s not 11 months old. Dr. Hutson thinks Gidget’s probably 8 months old tops. Now that explains a few things! Gidget decided last Monday that she might like the taste of the bay window sill and moved on to the surfboard coffee table. Luckily, Bruce is handy at fixing wood things, she didn’t hurt herself, and we have gone back to using the crate while we’re gone for during the workday. It’s just too long of a stretch for her to be left to her own devices—and the naughty 3Gs didn’t police her very well. Still, I know she looks forward to the Kong filled with peanut butter (I freeze it for less mess). At the vet we decided to get her DNA tested like we did for Godiva (lab-bull terrier-chow-English setter) and George (lab-golden retriever-pomeranian-some other small dog). We’ve assumed Guinness is 100% lab but several people have remarked that he might have some Great Dane in him. Looks enough like a lab that we’re not bothering with DNA. I’ll let you know what we find out about Gidget. We should know in a couple of weeks. Any guesses? We think terrier of some sort for sure, but who knows? Gidget’s gained a few pounds (yay!) and seems to be getting a little bit taller. She also was a wee bit sick and the vet found out she had giardia. Unfortunately, it’s contagious when you have a pack so It’s meant treating all the dogs this week. They haven’t minded much since we mix the medicine (it’s a powder that must taste delicious) with their favorite wet food. They’re going to be sad tomorrow when they take their final dose. They all line up and sit when they see us doling out the wet food and sprinkling the powder on. We have to hold each dog’s bowl to make sure each gets their own dose (it’s by weight). As you know, George would be glad to take everyone’s medicine. I hope that you’re all doing great. Thank you for your kind words about my last post. We are all so glad that Gidget found her forever home. PS: I’m sorry that I haven’t written much lately. Work’s been a little nutty. And having a puppy in the house again is keeping everyone on their toes. I’m hoping that things have settled down a bit now. This entry was posted in So and tagged 4G network, blue, bold color, bruce, DIY, dogs, George, giardia, Gidget, Godiva, Gs, Guinness, ironing board cabinet, Julie Petroski, Labrador Retriever, laundry room makeover, Mortroski Midcentury, organization, painting, sewing, so, Texas, work. Bookmark the permalink. 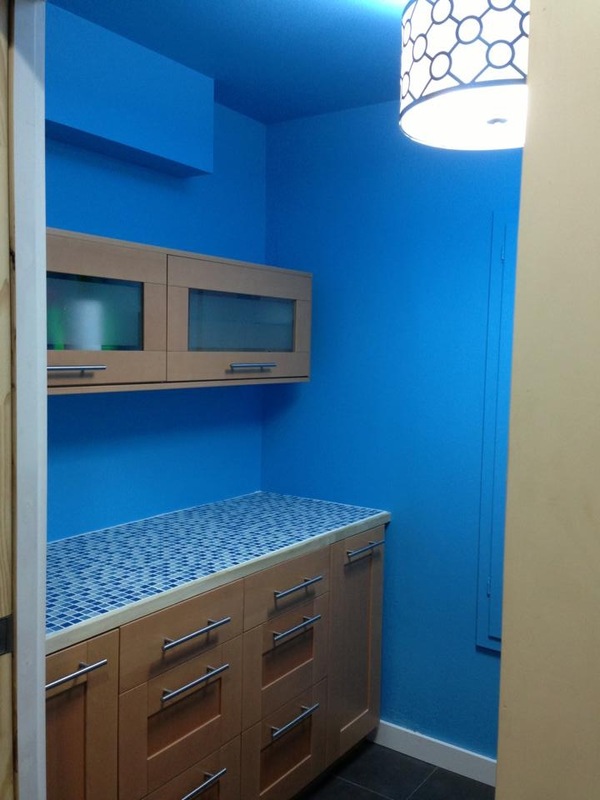 I love love love your blue laundry room. I definitely do not think it is too bright. Glad the 4Gs are taking their medicine. Hope Gidgit stops chewing the furniture so she can hang out with the others. Thank you. Give Gidget a few more months of learning and she’ll be snoozing on the sofa before you know it. 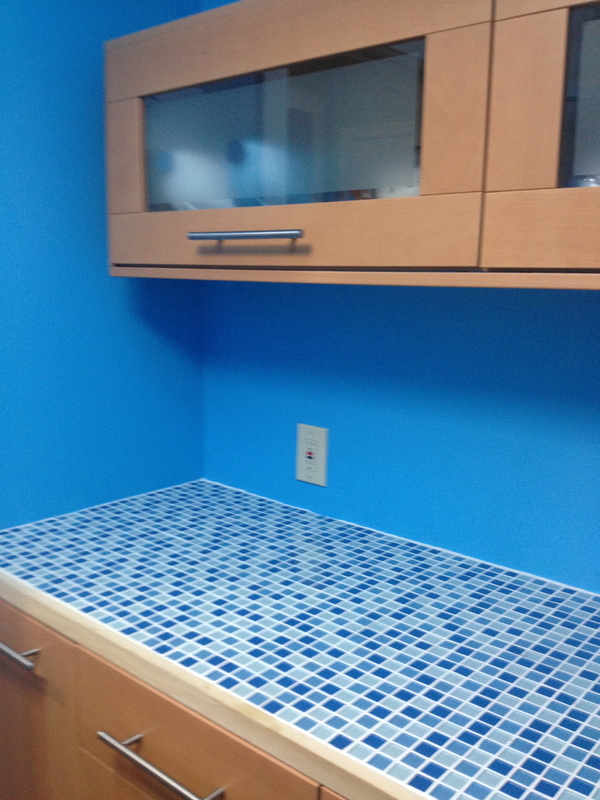 I agree with Fransi – love the blue laundry room and especially love the tiled counter. I lived in a house in Vancouver for a few years with an ironing board hidden in the cupboard and thoroughly appreciated it…although I do find my ironing board stays permanently set up in my office (not that I do any ironing but it definitely adds to the available space for stacking files). And was also wondering how the dogs fared during the painting – glad to hear Gidget has now been truly initiated 🙂 I haven’t had to paint since I got my pup but know the time is coming soon to figure out the logistics of paintbrushes, drip trays, drop cloths & a rambunctious terrier (who also hates ladders which will make painting high spaces fun!). Thank you! I love hearing that other people have had the ironing board cupboard too. As for painting with dogs, when we had our townhouse in toronto painted by an awesome pro painter, he had the pleasure of our bulldog Daisy following him around from room to room. She slept on his tarps and snored while he worked. When he was done, John told us that he was going to miss having her around. She was used to us doing our DIY projects! The Gs are all also used to the projects. George used to be very scared of the loud noises from the power tools but he’s fine now, although he’d prefer not to hang around and see what’s happening. Gidget is very curious about everything. She enjoyed watching the chip saw last weekend. He’ll be ok. You just have to be ok with a slightly painted dog if he leans into it. Luckily dog shampoo takes latex paint off. Loving the tile counter top! 🙂 Wish we could do some work on our place, but Hubby and I are saving up for a replacement vehicle. Our current wheels will be hitting the 200,000 mile mark on the odometer probably by the end of September. Ohhhh, giardia is nasty stuff. 😦 Hope your 4G’s are all fine! Thank you! Believe me we wouldn’t be able to do as many “improvements” as we’ve done if it wasn’t for smart shopping and doing it ourselves vs hiring someone. The Gs are great. Right now everyone (minus Guinness) is playing and anxiously awaiting their morning walk. 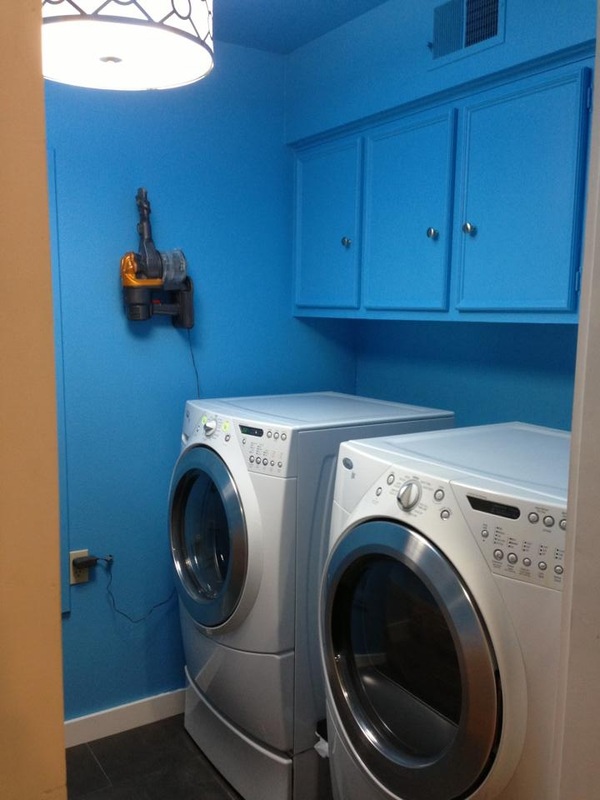 The laundry room looks great, love the colour. Glad new G is settling in, sounds like your vets know what they are doing and lucky they like the medicine! Interested to hear what she is, I have no idea about dogs so can’t offer any suggestions! However, this particular blue (and any shades close to its value) IS my favorite blue! I like this color out in the garden too. 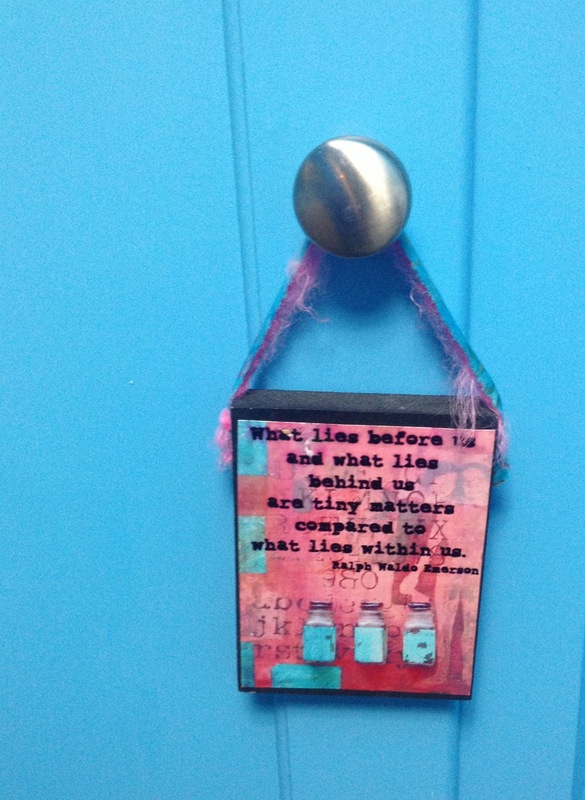 Paint it on a bench, or a door to wherever, doesn’t matter. It is a gorgeous magnet in the garden and always draws you further in!